Indeed like so many summer evenings – this summer! Light levels have been low. But tonight Havocs had two firsts! Elsa and Esther – what splendid swots! This entry was posted in Dance Outs on June 28, 2016 by Nigel Northcott. The eagle-eyed reader of these pages may have noticed that we have had occasion to put in the odd little grumble about one or two evenings where the weather was a little damp. 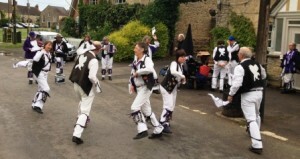 Our trip to Wolvercote on Saturday lunchtime, to join Wolvercote Morris at the Wolvercote Fete 2016 started well, with a free beer by the green in Lower Wolvercote. The sun shone brightly, and several of us had to see the shade. We started dancing just off the green, and after a few dances from each side joined forces for Constant Billy. One set from Wolvercote, one from Cry Havoc. A couple of drops of rain fell as we started. By the time we got to the first chorus it was raining steadily. 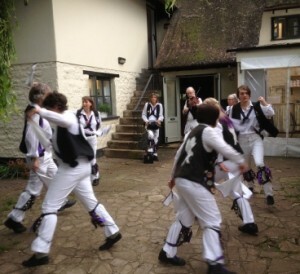 By the time the second chorus arrived, the rain was belting down, and mixing in a bit of hail. By this stage both sides were completely drenched, but nobody wanted to be the first to break for cover. The dance was duly danced to completion. 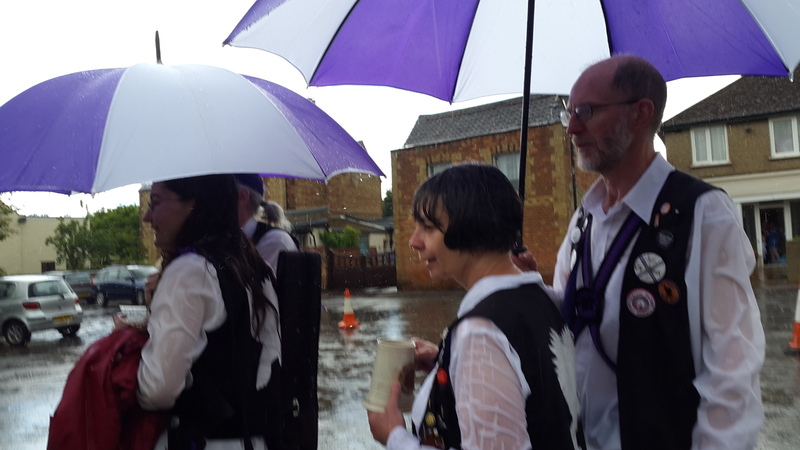 Mercifully, after a little added thunder and lightning, the rain stopped and we were able to dry out a bit for a few more dances, and then the procession up to the church. During which the rain started again. Squire and Foreman were thoroughly bedraggled by the time we got to the church; the rest had procured a board to hide under. This entry was posted in Dance Outs on June 27, 2016 by Jim Hague. We passed a dry and warm night forgetting all about the day’s referendum with the very excellent Summertown Morris. 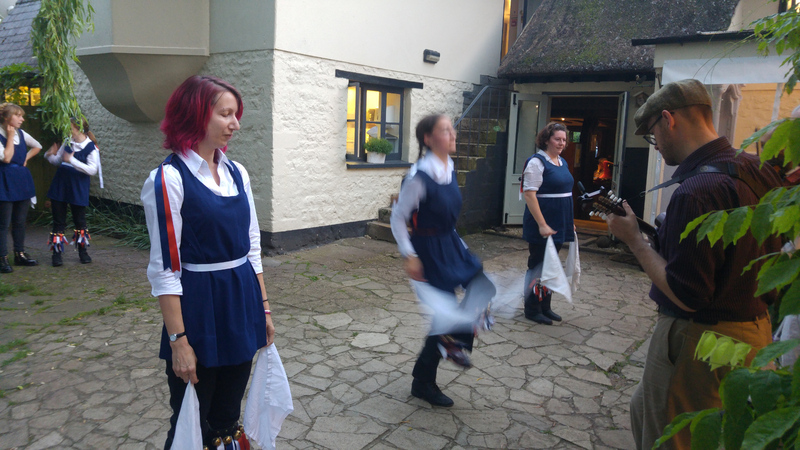 Our young Nerys dances with them as well as us; the one picture I have from the evening has her in full motion, and considerably blurred. 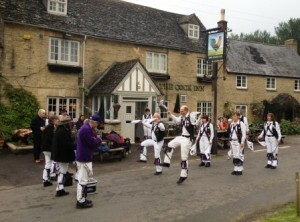 Summertown Morris at the Perch in Binsey. 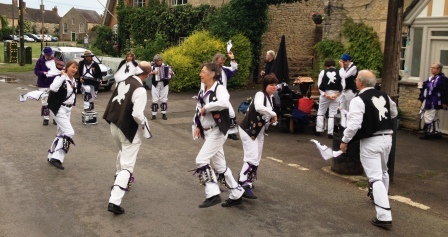 After the cold and drizzle the previous week, the evening was a huge improvement, despite very limited space for dancing and a pothole awaiting the unwary. Summer continues to elude us – eventually rain stopped play at around 9 – mind you at least we made a good turnout – our opponents cried off! Retreated to inside to drive off ‘liberace’ before the deluge! This entry was posted in Dance Outs on June 17, 2016 by Nigel Northcott. From the ridiculous to the sublime. 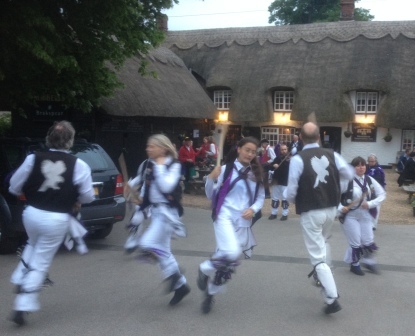 After a very chilly evening last week – the log fire the pub was so very very welcome – we jumped this week to a perfect midsummer evening at the Plough in Great Haseley with our old friends Owlswick Morris. 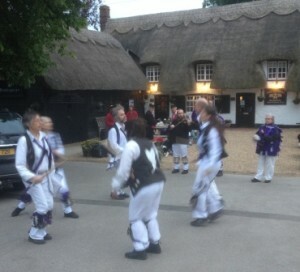 There’s one rather unusual thing about Owlswick, as Morris sides go. 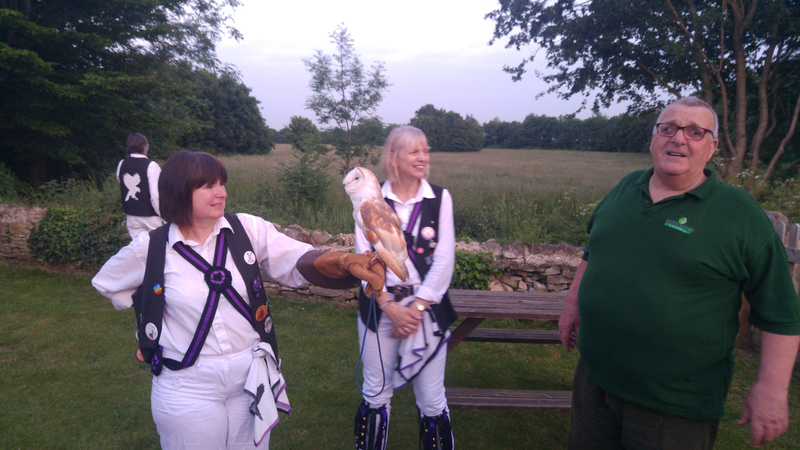 They frequently appear accompanied by their very own owl, and this week was one of those occasions. Isobel holds the Owlswick owl. 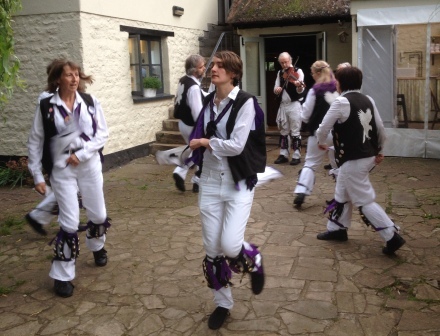 With the weather so balmy, we carried on dancing until the light started to fade, and then enjoyed the rest of a near-perfect evening with some music and chat. Oh well. English weather being what it is, that might just have been summer. This entry was posted in Dance Outs on June 11, 2016 by Jim Hague. Six bells at Warborough – Flaming June!! Well – if this is June and it’s supposed to flame – something has gone awry! It was cold and the pub had a roaring fire! 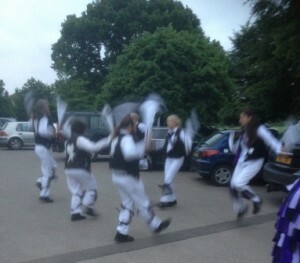 Light levels were low – thus the blurred hankies – or was it they were moving fast to keep warm! Dancing with Old Speckled Hen!! This entry was posted in Dance Outs on June 3, 2016 by Nigel Northcott.